Abstract: The analysed Triassic (Illyrian, Lower Fassanian, Upper Carnian) radiolarian cherts on Zumberak, Ivanscica, Kalnik and Medvednica Mts. (NW Croatia) are rocks with high SiO2 content (mean >90 %) and the major part of silica is of biogenic origin. Besides this siliceous component, two others stand out in the radiolarian cherts. One of them is detritic (terrigenous input) and it consists mainly of Al, Ti, K, Zr, Hf, Cr, Th, Rb, Nb and Sc. The other, hydrothermal one, is composed of Fe, Mn, P, Cu, Pb, Zn, Ni, Co and Sr. The terrigenous component is a significant REE carrier. The radiolarian cherts on Kalnik and Medvednica Mts show a positive Ce-anomaly (Ce/Ce*) which indicates a sedimentation in a narrow trough relatively close to the continent. The negative Ce-anomaly on Zumberak and Ivanscica Mts suggests a reduced terrigenous input. The radiolarian cherts in the last mentioned areas are sedimented directly onto the dolomites and limestones of the carbonate platform. This means that the terrigenous input was probably weaker, because of the width of the disintegrated carbonate platform (larger distance to the continent) or because of a topographically higher position (bypass of fine terrigenous material) with respect to Medvednica and Kalnik. Abstract: Calpionellid fauna from the coral-bearing exotics of the Stramberk-type limestones from Polish Flysch Carpathians has been studied. Calpionellids of the Remanei Subzone and the Intermedia Subzone as well as the Calpionella Zone indicate the Late Tithonian (most of exotics) and the Early Berriasian age of exotics studied. In contrast to the Stramberk Limestone (Moravia), calpionellids of the Chitinoidella Zone have not been recognized in the studied material. Abstract: The lower part of the Late Cretaceous Tomalar Formation (Devrekani Basin, Central Pontides, northern Turkey) is characterized by the presence of light-green ribbon cherts and cherty mudstones (approximately 10 m thick) with abundant well-preserved Radiolaria. The presence and coexistence of such taxa as Acaeniotyle macrospina, Archaeospongoprunum salumi, Becus horridus, Cavaspongia euganea, Dactyliodiscus longispinus, Halesium sexangulum, Hexapyramis pantanellii, Pessagnobrachia irregularis, Pyramispongia glascockensis, Savaryella quadra, Vitorfus brustolensis, Novixitus dengoi, N. weyli, Phalangites telum and others clearly indicate the Cenomanian age. The Tomalar Formation covers the whole Upper Cretaceous due to the presence of Maastrichtian planktonic Foraminifera from the upper part of this formation. The radiolarian assemblage of the Tomalar Formation correlates well with the coeval fauna of the Western Mediterranean. Abstract: In this study we present a paleoecological interpretation based on quantitative analysis of middle Karpatian (latest Burdigalian) benthic and planktonic foraminifers and calcareous nannofossils from Hole BL 503 (Wienerberger) drilled at Laa an der Thaya, Lower Austria. Multivariate statistics based on the Bray-Curtis Similarity, non-metric MultiDimensional Scaling (nMDS) and Similarity and Dissimilarity Term Analyses are applied to raw data to identify the ecological gradients subtending the assemblages. Species abundance curves (%) were also plotted. A paleoclimatic curve was obtained using the algebraic sum of planktonic foraminifers warm- and temperate-water indicators (positive) and cool-water indicators (negative) to highlight the paleoclimatic trend during the middle Karpatian. Our data indicate that the sediments drilled at Laa Th. were deposited in water depth not exceeding 200 m, relatively "near shore" in an environment characterized by a generally high concentration of organic matter, suboxic to dysoxic conditions, high nutrient availability, variable salinity and generally cool paleoclimate. On the basis of nannoplankton distribution we also suggest that nutrient availability and upwelling conditions, rather than other ecological factors, control the distribution of calcareous nannoplankton in the Molasse Basin. Abstract: Early Miocene deposits of fresh-water environments are characteristic in the Kalnik Mountain area, at the SW marginal zone of the Pannonian Basin System. Alluvial and lacustrine sediments varying from gravel to marl accumulated by different depositional processes during the Ottnangian. In the early, alluvial phase pebbly braided rivers developed. Deposition was characterized mostly by bar conglomerates and flood plain siltstones. Alluvial deposition was controlled by both autocyclic and allocyclic processes, in a semi-arid climate. During the later, lacustrine phase, sedimentation was mostly represented by marls and occasional coarser material, in a humid climate. Fresh-water deposition was terminated by marine transgression during the Karpatian. 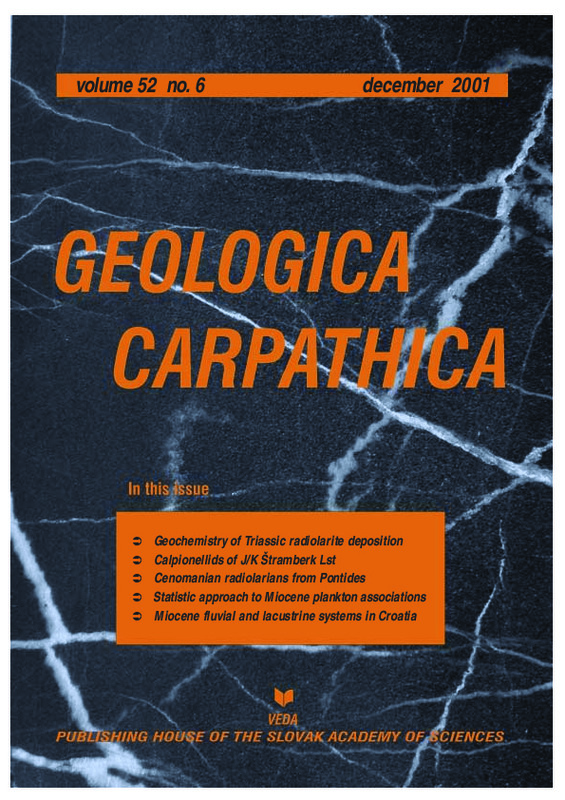 Lower Miocene fresh-water deposits of the Kalnik Mountain can be correlated with similar deposits in the wider area of Northern Croatia. The Kalnik Mountain represents the boundary area between two Early Miocene basins, the north-western one being characterized by marine deposition, and the south-eastern by contemporaneous fresh-water deposition, both belonging to the Central Paratethys.